Call it Recyclin’ Renault: The French automaker is now using old electric-car batteries to power charging stations in Europe. These so-called “second-life” batteries were integrated with energy-storage systems from British firm Connected Energy and installed at two charging sites on highways in Belgium and Germany. Like its partner Nissan, Renault is a major proponent of electric cars. Its Zoe hatchback rivals the Nissan Leaf as the best-selling electric car in Europe – meaning a lot of used batteries. The battery packs in electric cars eventually lose too much storage capacity to be useful. But even after they’re too degraded for automotive use, these packs still have plenty of capacity left over. 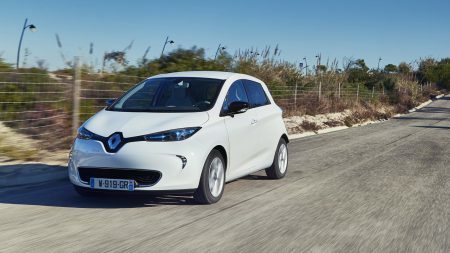 By using them to power charging stations, Renault claims DC fast-charging stations can be installed in more locations, since they won’t require a dedicated high-power grid connection. Instead, the battery packs can be charged using the same electricity infrastructure as lower-power stations. In the United States, Tesla has used solar energy to charge energy-storage battery packs, taking some charging stations completely off the grid. Nissan and Chevrolet have experimented with turning old battery packs into energy-storage units, and BMW has even discussed selling them to homeowners. More broadly, energy storage is now being used to increase the effectiveness of renewable-energy sources like wind and solar. Energy is harvested when wind and sunlight are available, and stored for when they aren’t. Energy storage can also help balance the grid by evening out the flow of electricity through the system. California already has some large energy-storage sites, and Tesla is involved with a major project in Australia. Large-scale energy-storage projects will require a lot of batteries, and if electric-car sales live up to the hype, automakers could end up with plenty on their hands.